My cousins, Joe & Tammy, fed us this dinner about 20 years ago. It is great! We usually skip the sauce but sometimes serve regular gravy along with the chicken. Make sure you use a large enough baking dish to accommodate all the vegetables. Combine rosemary, sage, thyme and pepper in a small bowl. Rub chicken with salt. Using half the herb mixture, rub some of the herb mixture inside the chicken and put 1 bay leaf in the cavity. Rub 2 tbsp. oil on chicken and rub on herb mixture. Place in large baking pan. Surround chicken with potatoes, shallots and carrots. Toss with remaining oil and herb mixture. Add remaining bay leaf. Bake chicken upside down for 45 minutes. Turn chicken over and continue cooking until done, approximately 1 1/4 – 1 1/2 hours total. Toss vegetables occasionally. Temperature in the joint where the leg attaches to the body should be 185F. Remove from oven, rest 15 minutes. Keep warm if preparing sauce. Sprinkle vegetables with minced parsley if not preparing sauce. Pour pan juices into large glass measuring cup and degrease. Add enough stock to measure 2 cups. Add vinegar to baking pan and bring to boil over medium heat; scraping up any browned bits. Boil until thickened, about 4 minutes. Add stock mixture and boil until reduced by half, about 10 minutes. Reduce heat to low and whisk in butter 1 piece at a time. Adjust seasoning to taste. Stir in parsley. Serve sauce over vegetables and chicken. Wear rubber gloves to prevent burning hands. Drain, rinse and dry thoroughly. Combine remaining ingredients; simmer 15 minutes. Remove garlic. Keep boiling. 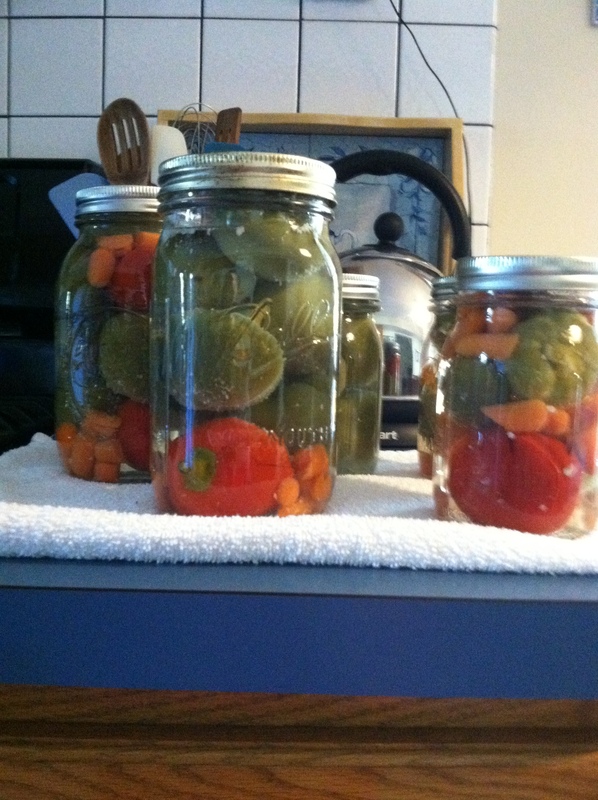 Pack peppers into hot jars. Pour boiling brine over peppers, leaving 1/4-inch head space. Remove air bubbles. Add caps. Process 10 minutes in a hot water bath. Yield about 8 pints. This recipe calls for long peppers, if you use cherry peppers like I did, it is easier to use wide mouth jars. Home canning is great but serious business. My mom canned everything but I am seldom that brave. Foods that are acidic or packed in an acid brine may be processed in a hot water bath. All other foods must by pressure canned. Be sure to be familiar with canning processes before undertaking canning for the first time. Bacteria love to grow. Wash jars thoroughly. Place, inverted jars in a large pan with water to heat and steam jars for about 10 minutes. Keep the jars in the water bath until ready to use. Wipe the top of the jar with a clean towel dipped into the boiling water before adding the lids. A dirty rim will not seal. Dip the lids & rings into the hot water before placing on the jar. Use only new lids. Don’t skip the hot water bath, the water must cover the top of the jars by at least an inch. A deep stock pot or canning pot is needed. My thanks to “The Shiksa in the Kitchen” blog for the courage to make falafel. Her blog has pictures and step by step directions, so in my tradition here are the barest minimum of steps. My ingredients vary only slightly. This amount makes too much for two people. But we like leftovers. Soak the chickpeas 12 hours. Drain. Place the chickpeas, cilantro and parsley in the bowl of a food processor. Pulse until blended. Add the remaining ingredients and pulse until a coarse paste forms. Place in a bowl, cover with plastic wrap and refrigerate at least 1-2 hours. Form into small balls about the size of a golf ball and fry in 2 inches of hot oil until golden brown. In a small bowl stir together 2 tbsp. tahini, 1 tbsp. lemon juice and enough water to make a thin sauce. Add salt to taste. In a large pan with a tight fitting lid, add the wine, shallots, herbs and butter. Boil 3 minutes. Add the mussels, cover the pot and steam until the mussels open, about 5 minutes. Remove the mussels as they open and place on a large bowl/plate. Pour the sauce over when done. Sprinkle with finely chopped parsley. You may strain the sauce through cheesecloth to get rid of any sand, we just pour it over. Scoop some sauce into little bowls for dipping the mussels in as you eat them to rinse off any remaining grit.